Organic Frankincense has been used since antiquity with references of the treasured resin bestowed to Jesus by the three wisemen. It is grown primarily in the Middle East, Northern Africa, and India. This listing is for the exotic and sought after Boswellia Carterii. It has a richer consistency and deeper scent than it’s sister varieties. It is considered an extremely therapeutic oil. Organic Frankincense essential oil is renown for its ability to decrease visible signs of aging by acting as an astringent (tightening the skin and promoting a supple youthful appearance) and promoting cellular regeneration. It’s strongly anti inflammatory and antiseptic, making this essential oil a must have. Organic Frankincense essential oil has demonstrated the ability to strengthen the immune system by producing surplus T-Lymphocytes (White bloods cells) and stimulating the lymphatic system. Various studies have shown frankincense essential oil to be effect at reducing the rate of tumor growth. Organic Frankincense essential oil is an excellent addition to cosmetic applications, personal care formulations, soaps, perfumery, incense, candles, and aromatherapy. 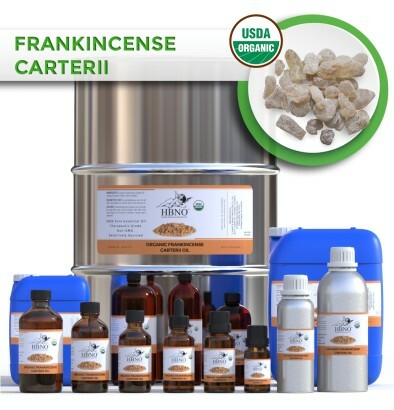 HBNO is pleased to offer USDA Organic frankincense carterri essential oil in bulk and wholesale quantities. We can supply any amount of oil to anywhere in the world.